Commissioned by Stour Valley Arts to make outdoor art for King’s Wood, Challock, Kent UK. This piece of collaborative art was made with the help of Forest Enterprise in an area of the forest which has a monoculture of sweet chestnuts. The ideas I had for the forest were for two very different pieces. I chose the B52 Aircraft as subject matter for one of the environmental artworks because it was the time of the Iraq war and it seemed such a powerful symbol. The aircraft is a heavy American bomber one of the most efficient, long lived and destructive components of modern warfare. It is an aggressive carrier of nuclear or precision-guided weapons. My idea was to subvert the hard edges of this destructive and aggressive aircraft into an ecological negative space cut into the trees. Avenues with a difference which allow entry and exit at every point and which are always changing. 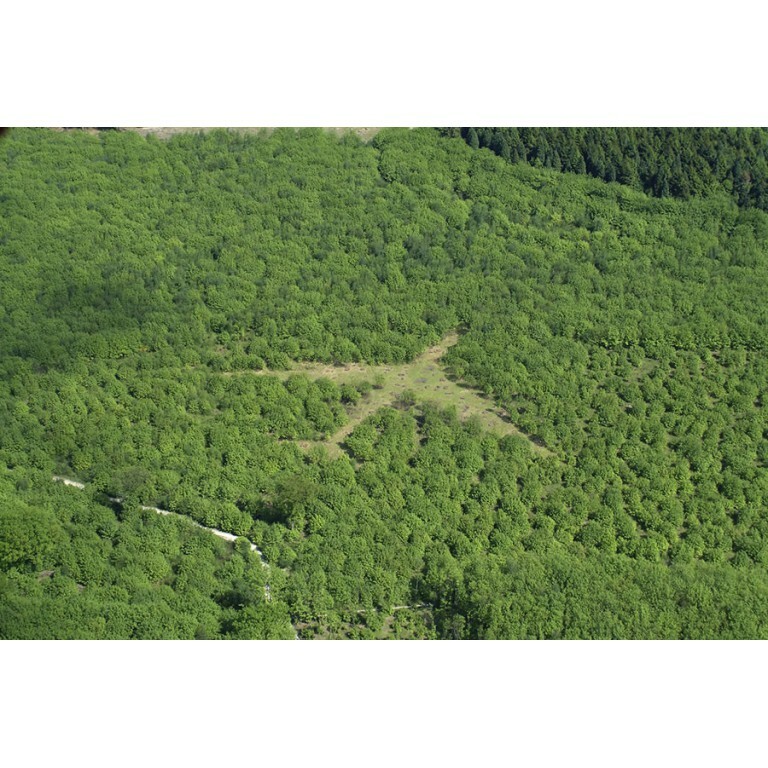 The clearing created allows light and greater biodiversity into the forest. The piece was made roughly double the size of the bomber and sited on the side of a gradual slope. The other piece of land art that I made at the same time is called Ring. Both pieces were shortlisted for the Rouse Kent Award for Public Art, and Ring was the one that won it. Commission: Stour Valley Arts, Challock, Kent UK.